Mammoth Ski Resort Discount Ski Tickets! GetSkiTickets.com! DEAL! 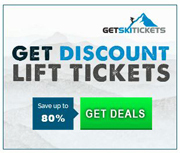 : - 1-7 day discount ski tickets at up to 50% off! You may redeem this voucher at any Mammoth Mountain ticket window. Remember that you must have a valid Govt. issued Photo ID to receive your lift tickets. Customers without vouchers will not receive lift tickets. Please allow 48 hours to process an order. If you have any questions please contact Liftopia directly at (800) 349-0870 or support@liftopia.com.